The whooping crane (Grus americana), the tallest North American bird, is an endangered crane species named for its whooping sound. Along with the sandhill crane, it is one of only two crane species found in North America. The whooping crane's lifespan is estimated to be 22 to 24 years in the wild. After being pushed to the brink of extinction by unregulated hunting and loss of habitat to just 21 wild and two captive whooping cranes by 1941, conservation efforts have led to a limited recovery. The total number of cranes in the surviving migratory population, plus three reintroduced flocks and in captivity, now exceeds 800 birds. 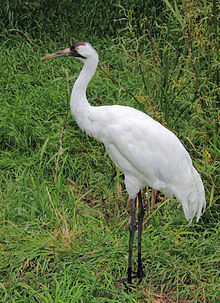 An adult whooping crane is white with a red crown and a long, dark, pointed bill. However, immature whooping cranes are cinnamon brown. While in flight, their long necks are kept straight and their long dark legs trail behind. Adult whooping cranes' black wing tips are visible during flight. Whooping cranes breed in marshes. A whooping crane foraging on a cattle ranch in Osceola County, Florida. These birds forage while walking in shallow water or in fields, sometimes probing with their bills. They are omnivorous but tend to be more inclined to animal material than most other cranes. Only the red-crowned crane may have a more carnivorous diet among living cranes. In their Texas wintering grounds, this species feeds on various crustaceans, mollusks, fish (such as eel), small reptiles and aquatic plants. Potential foods of breeding birds in summer include frogs, small rodents, small birds, fish, aquatic insects, crayfish, clams, snails, aquatic tubers, and berries. Six studies from 1946 to 2005 have reported that blue crabs are a significant food source  for whooping cranes wintering at Aransas National Wildlife Refuge, constituting up to 90 percent of their energy intake in two winters; 1992–93 and 1993-94. Waste grain, including wheat, barley, and corn, is an important food for migrating whooping cranes,  but whooping cranes don't swallow gizzard stones and digest grains less efficiently than sandhill cranes. In earlier years, whooping crane chicks had been caught and banded (in the breeding areas of Wood Buffalo National Park), which has delivered valuable insight into individual life history and behaviour of the cranes. This technique, however, has been abandoned due to imminent danger for the cranes and the people performing the catching and banding activities. By recording guard and unison calls followed by frequency analysis of the recording, a "voiceprint" of the individual crane (and of pairs) can be generated and compared over time. This technique was developed by B. Wessling and applied in the wintering refuge in Aransas and also partially in the breeding grounds in Canada over 5 years. It delivered interesting results, i.e. that besides a certain fraction of stable pairs with strong affinity to their territories, there is a big fraction of cranes who change partners and territories. Only one of the exciting results was to identify the "Lobstick" male when he still had his band; he later lost his band and was recognized by frequency analysis of his voice and then was confirmed to be over 26 years old, and still productive. In 1957, the whooping crane was featured on a U.S. postage stamp supporting wildlife conservation. In the early 1960s, Robert Porter Allen, an ornithologist with the National Audubon Society, appeared as a guest challenger on the network television show " To Tell The Truth", which gave the Conservation movement some opportunity to update the public on their efforts to save the whooping crane from extinction. His initial efforts focused on public education, particularly among farmers and hunters. Beginning in 1961, the Whooping Crane Conservation Association (WCCA), was established to improve the status of the whooping cranes. This non-profit organization functioned largely by influencing federal, state and provincial political decisions and educating the general public about the critical status of the bird. The whooping crane was declared endangered in 1967. Meanwhile the wild crane population began a steady increase, such that in 2007 the Canadian Wildlife Service counted 266 birds at Wood Buffalo National Park, with 73 mating pairs that produced 80 chicks, 39 of which completed the fall migration,  while a United States Fish and Wildlife Service count in early 2017 estimated that 505 whooping cranes, including 49 juveniles, had arrived at Aransas National Wildlife Refuge that season. A March 2018 Fish and Wildlife Service report counted an additional 161 cranes in captivity at twelve different sites, and an estimated 177 in three reintroduced flocks,  putting the total current population at over 800. Several attempts have been made to establish other breeding populations outside of captivity. Young whooping cranes destined for the Eastern Migratory Population of reintroduced birds completing their first migration, from Wisconsin to Florida, in January 2009, following an ultralight aircraft. A third attempt has involved reintroducing the whooping crane to a new flyway established east of the Mississippi river, with its southern end just west of the Atlantic flyway. This project used isolation rearing of young whooping cranes and trained them to follow ultralight aircraft, a method of re-establishing migration routes pioneered by Bill Lishman and Joe Duff working with Canada geese. The ultralight flights were managed by a non-profit organization, Operation Migration,  working with the larger Whooping Crane Eastern Partnership (WCEP), which oversees all aspects of the reintroduced Eastern Migratory Population. Subsequent to hatching, the Operation Migration cranes were taught to follow the ultralight, fledged over their future breeding territory in Wisconsin, and led by the aircraft on their first migration from Wisconsin to Florida. Having learned the migratory route, they then returned north on their own the following spring. With the growth of this reintroduced population, WCEP also began releasing captive-reared juvenile cranes directly into the flock to learn migratory behavior from their peers, in a process referred to as Direct Autumn Release (DAR). "Whooping Crane(Grus americana)". Texas Parks and Wildlife Department. Retrieved December 9, 2006. McNulty, Faith, The Wildlife Stories of Faith McNulty, Chap.6 "The Whooping Crane" (pages 121-309), Doubleday 1980 (Chap. 6 was originally published as a book of the same title by E.P. Dutton in 1966). Much of her account deals with the work of Robert Porter Allen. Tesky, Julie L. (1993). "Grus americana". U.S. Department of Agriculture, Forest Service, Rocky Mountain Research Station, Fire Sciences Laboratory. Retrieved December 9, 2006. "Whooping Crane: On a Lost Path". U.S. Fish and Wildlife Service, Alamosa/Monte Vista National Wildlife Refuge. Retrieved December 9, 2006. "Whooping Crane Flock Status". Whooping Crane Conservation Association. Retrieved January 27, 2007. "Whooping Crane". International Crane Foundation, Baraboo, Wisconsin. Archived from the original on 2006-12-12. Retrieved December 9, 2006. ^ BirdLife International (2012). "Grus americana". IUCN Red List of Threatened Species. Version 2013.2. International Union for Conservation of Nature. Retrieved 26 November 2013. ^ "Quivara National Wildlife Refuge: Whooping Crane, Grus americana". U.S. Fish & Wildlife Service. Retrieved 6 January 2017. ^ a b c Collar, J., Del Hoyo, J., Elliot, A., & Saragatal, J. (1996). Handbook of the birds of the World. Volume 3. Hoatzin to auks. Lynx Edicions. ^ Soothill, E., & Soothill, R. (1982). Wading birds of the world. Blandford Press. ^ "Whooping Crane (Grus americana)". Texas Parks and Wildlife Department. Retrieved 2007-12-20. ^ Dunning, John B. Jr., ed. (2008). CRC Handbook of Avian Body Masses (2nd ed.). CRC Press. ISBN 978-1-4200-6444-5. ^ Fisher, H. I., & Goodman, D. C. (1955). The myology of the whooping crane, Grus americana. Illinois biological monographs; v. 24, no. 2. ^ a b c "Whooping Crane - - Birds of North America Online". bna.birds.cornell.edu. ^ Johnsgard, P. A. (2015). A chorus of cranes: the cranes of North America and the world. University Press of Colorado. ^ "Craneworld - Kraniche in Bild und Ton: Schreikraniche im Duett". www.craneworld.de. ^ "Whooping Crane - Grus americana" (PDF). Texas Parks & Wildlife. Texas Parks and Wildlife Department. Retrieved February 3, 2019. Parents separate from their young of the previous year at the beginning of spring migration, while in route to the breeding grounds, or soon after arrival on the breeding grounds. ^ Tesky, Julie (1993). "Grus americana". Fire Effects Information System. USDA Forest Service. Retrieved 2009-11-23. ^ "NPS NNL description of Salt Plains". National Park Service. ^ "Species Status and Fact Sheet: WHOOPING CRANE". U.S. Fish and Wildlife Service. ^ Wright, Greg D.; Harner, Mary J.; Chambers, James D. (2014). "Unusual wintering distribution and migratory behavior of the Whooping Crane (Grus americana) in 2011–2012". The Wilson Journal of Ornithology. 126 (1): 115–120. doi: 10.1676/13-071.1. Retrieved February 3, 2019. ^ Shryock, John. "Endangered whooping crane shot to death in Ala". wsfa.com. ^ a b "Whooping Crane Survey Results: Winter 2017–2018" (PDF). U.S. Fish and Wildlife Service. Retrieved 2018-08-27. ^ "Whooping Crane - - Birds of North America Online". bna.birds.cornell.edu. ^ "Whooping crane chick becomes bobcat victim". deseretnews.com. 29 May 2000. ^ "Bobcat's A Suspect After 4 Whooping Cranes Killed". orlandosentinel.com. ^ Long, Jeff (2001-12-20). "Whooping crane flock loses 2nd member". Chicago Tribune. ^ Kreger, M. D., Hatfield, J. S., Estevez, I., Gee, G. F., & Clugston, D. A. (2006). Behavioral profiles of the captive juvenile whooping crane as an indicator of post‐release survival. Zoo Biology: Published in affiliation with the American Zoo and Aquarium Association, 25(1), 11-24. ^ "Bobcats Thin Flock Of Endangered Whooping Cranes". orlandosentinel.com. ^ Meine, C., & Archibald, G. (Eds.). (1996). The cranes: status survey and conservation action plan. IUcN. ^ "Craneworld - Resumés: 7.3 Resumé 2003: Acoustic individual monitoring over six years". www.craneworld.de. Archived from the original on 2006-05-09. Retrieved 2012-03-22. ^ a b c d e f g McKennirey, Michael (1976). "A Great White Bird". National Film Board/Office national du film, Canada. ^ a b c Draft Environmental Assessment: A Proposal to Translocate Whooping Cranes from a Discontinued Non-Essential Experimental Population (BEP) in Central Florida to an Ongoing NEP in Southwestern Louisiana (PDF) (Report). U. S. Fish and Wildlife Service. June 2017. ^ a b Whooping Crane Master Plan for 2007 (PDF) (Report). January 2007. ^ "Tex, the whooping crane who needed a little encouragement..." UPI. June 24, 1982. Retrieved 2 October 2017. ^ "George & Tex". YouTube - International Crane Foundation. Retrieved 2 October 2017. ^ "Man courts whooping crane for three years to save it from extinction". Tree Hugger. June 30, 2015. Retrieved 2 October 2017. ^ "CANUS – 186 whooping crane descendants". Whooping Crane Conservation Association. 2013-02-25. Retrieved 2018-08-27. ^ "A 50-year effort to raise endangered whooping cranes comes to an end". Washington Post. September 18, 2017. Retrieved 1 October 2017. ^ "Texas acquires land for endangered cranes". Victoria Advocate. 2012-10-12. Retrieved 2018-08-28. ^ Stephens, Garry. "Easement Program Enhances and Restores Whooping crane Wintering Habitat". USDA Natural Resources Conservation Service: Texas. Retrieved 2018-08-28. ^ "Critical Whooping Crane Wintering Grounds Purchased". Whooping Crane Conservation Association. Spring 2012. Retrieved 2018-08-28. ^ Sikes, David (2016-12-08). "Whoopers expand territory along Mission River and delta". Corpus Christi Caller-Times. Retrieved 2018-08-28. ^ Satija, Neena (2014-08-21). "Texas Buys Conservation Land With Oil Spill Money". The Texas Tribune. Retrieved 2018-08-28. ^ Butler, Matthew J.; Metzger, Kristine L.; Harris, Grant M. (1 April 2017). "Are whooping cranes destined for extinction? Climate change imperils recruitment and population growth". Ecology and Evolution. 7 (8). doi: 10.1002/ece3.2892/full. ^ a b "FAQ: Whooping Crane Reintroduction in Louisiana". Department of Wildlife and Fisheries, State of Louisiana. ^ a b Behrendt, Barbara; Pittman, Craig (2018-03-08). "Whooping cranes didn't so well in Florida. Next stop: Louisiana". Tampa Bay Times. Retrieved 2018-08-27. ^ "Florida Whooping Crane Non-Migratory Flock (Synopsis)". Whooping Crane Conservation Association. Archived from the original on 2009-06-30. Retrieved 2006-12-09. ^ Crane Migration Operation Migration. ^ Walker, Cameron (5 February 2007). "Rare Cranes Led on Migration Killed in Florida Storms, Only 1 Survives". National Geographic Society. Retrieved 21 October 2015. ^ "Single Whooping Crane survives Florida tornadoes". BirdLife International. 2007-06-02. Retrieved 2007-12-20. ^ "Field Journal". Operation Migration Inc. Retrieved 2007-12-20. ^ "Flock Status – 2011 May « Whooping Crane Conservation Association". Whooping Crane Conservation Association. ^ Whooping Crane Eastern Partnership December 2010 Project Update (Report). Whooping Crane Eastern Partnership. December 2010. Archived from the original on 2011-05-28. Retrieved 2011-05-09. ^ Whooping cranes are cleared for takeoff after getting FAA exemption - CNN January 10, 2012 - accessed July 8, 2013. ^ Tribune wire reports (2016-01-24). "Feds to end ultralight aircraft-led whooping crane migration". chicagotribune.com. Retrieved 2016-06-05. ^ "Eastern Migratory Population Update". Operation Migration. 2018-06-06. Retrieved 2018-08-27. ^ http://www.chron.com/news/houston-texas/article/Hope-remains-despite-deadly-year-for-whooping-2449601.php Mathew Tresaugue, "Hope remains despite deadly year for whooping cranes in Louisiana"
^ Third Cohort of Whooping Cranes Released at White Lake WCA (Report). Louisiana Department of Wildlife and Fisheries. December 2012. ^ Fourth Cohort of Whooping Cranes Released at White Lake WCA (Report). Louisiana Department of Wildlife and Fisheries. January 2014. ^ 14 Juvenile Whooping Cranes Added to Louisiana's Experimental Population (Report). Louisiana Department of Wildlife and Fisheries. December 2014. ^ Eleven Juvenile Whooping Cranes Released into the Marsh at White Lake WCA (Report). Louisiana Department of Wildlife and Fisheries. January 2016. ^ The Associated Press (2017-04-11). "Louisiana milestone: wild-hatched whooping crane turns 1". nola.com. Retrieved 2017-04-15. ^ a b c 2013 Louisiana Whooping Crane Report (PDF) (Report). Louisiana Department of Wildlife and Fisheries. ^ a b 2014 Louisiana Whooping Crane Report (PDF) (Report). Louisiana Department of Wildlife and Fisheries. ^ Associated Press (2016-04-13). "It's a chick! Louisiana's 1st wild whooping crane since 1939". nola.com. Retrieved 2016-06-04. ^ "LW1-17 Hatches Successfully". Louisiana Department of Wildlife and Fisheries. Retrieved 10 April 2017. ^ Couvillion, Ellyn (2018-08-20). "Five new whooping crane chicks a major boost for reintroduction of once-native birds". THe Advocate. Retrieved 2018-08-27. ^ a b c "Ville Platte Man Cited for Shooting Whooping Crane". KATC.com. 2 August 2018. Retrieved 3 August 2018. ^ a b Main, Douglas (2016-08-05). "One in Five Whooping Cranes Dies from Gunfire: Some are Trying to Stop It". Newsweek.com. Retrieved 9 May 2017. ^ The Associated Press (2011-10-11). "2 rare whooping cranes shot in Louisiana, authorities say". nola.com. Retrieved 2016-06-11. ^ 2011 Louisiana Whooping Crane Report (PDF) (Report). Louisiana Department of Wildlife and Fisheries. The third bird in 2011 was last seen foraging with the two confirmed killed and its transmitter stopped working at the time of the shooting. It was never seen again, though failure to find a carcass prevented confirmation of cause of death. ^ "Up to $3,000 in Reward Money Offered for Information in Whooping Crane Shooting" (Press release). US Fish & Wildlife Service. 17 May 2013. Retrieved 2016-06-11. ^ Richard Burgess (2014-02-07). "Whooping cranes shot in Jeff Davis Parish". theadvocate.com. Retrieved 2016-06-11. ^ Courtney Collins (2015-01-22). "Whooping crane shot in Louisiana; $10,000 reward for info". KNOE.com. Retrieved 2016-06-04. ^ Associated Press (2016-01-14). "Southeast Texan arrested in killings of 2 whooping cranes". KXAN.com. Retrieved 2016-06-04. ^ a b Smith, Sonya (2016-10-26). "The Beaumont Man Who Killed Two Whooping Cranes Fined And Barred From Owning Firearms For Five Years". Texas Monthly. Retrieved 9 May 2017. ^ 2015-2016 Louisiana Whooping Crane Report (Report). Louisiana Department of Wildlife and Fisheries. Appendix to Harrell, Wade; Bidwell, Mark. Report on Whooping Crane Recovery Activities (2015 breeding season-2016 spring migration) (PDF) (Report). US Fish & Wildlife Service and Canadian Wildlife Service. ^ Associated Press (2016-06-02). "2 whooping cranes killed in Louisiana; reward being offered". theadvertiser.com. Retrieved 2016-06-04. ^ "Gueydan Man Pleaded Guilty for Illegal Shooting of Whooping Crane in Federal Court" (Press release). Louisiana Department of Wildlife and Fisheries. 11 July 2017. ^ "Local man convicted of killing whooping cranes headed to prison after violating probation". KFDM.com. Retrieved 17 July 2017. ^ Myers, Ben (April 10, 2018). "Two cited for shooting endangered whooping cranes, obstruction of justice". The Advocate. Retrieved August 6, 2018. Wikimedia Commons has media related to the whooping crane.